Contrary to the agriculture, the algoculture has less water requirement and asks for little surface of grounds. Algae growth is faster than that of terrestrial plants. It grows 20% a day when all the conditions are met, and requires less fertilizer. To start a culture of Spirulina, simply create a culture medium in a clean pool with salt and baking soda. In addition salt and bicarbonate, the culture medium contains nutrients: the main one being nitrogen (N) and then the phosphorus (P). Potassium (K), magnesium (Mg), calcium (Ca), iron (Fe) and sulfur (S) must also be added unless they are made in sufficient quantity of water, the salt or different nutrients. The water, salt and nutrients often provide trace elements (boron, zinc, cobalt, molybdenum, copper, etc. ), but infuffisante or variable quantity and it is preferable to ensure the supply of the main trace elements. Trace elements provided by the water and salt may be supplemented with clay. Then Spirulina is seeded in this medium. Allow to avoid photolyse* of Spiruline which tends to put itself on surface. The density allows to determine if the spiruline of a pond can be collected. She controls itself by means of a "secchi", a kind of small white record at the end of a gradual stalk which we plunge into the pond. When the color of the record becomes invisible, we spot a graduation. If she is between 2 and 2,5, the spiruline of the pond can be collected. Spirulina lives under very specific conditions: it grows in salt water, shallow, highly alkaline, rich in sodium carbonates and bicarbonates and strongly mineralized in the area of ​​the tropical belt. In these latitudes, the water temperature is between 20 and 40 ° C. The many birds and mammals that frequent these waters for thousands of years have created by their droppings and agitation a suitable environment for the development of spirulina. The Paracas Spirulina comes from Lake of the Huacachina oasis in the Ica region in Peru. 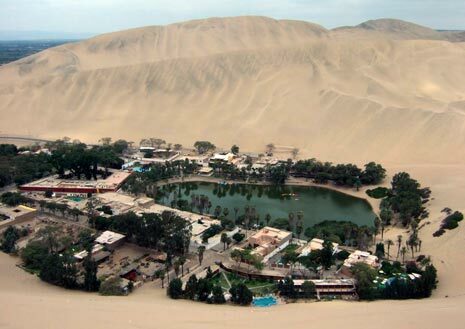 Surrounded by white sand of the desert, this oasis owes its origin to the inflow of underground streams. The Lonar spirulina comes from the Lonar crater in the State Maharashtra, India. 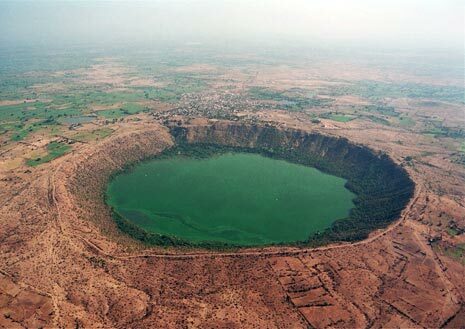 It is the largest crater left by a meteorite in basalt rocks and is partially filled by a lake of water "brackish". It has the advantage of reproducing at exceptional speed (about 20% per day when conditions are met). For its growth, it needs a lot of light and heat. The optimum temperature of the culture medium is between 20 and 38 ° C.
The pH of the culture medium is between 8.5 and 11. The high alkalinity does not allow the proliferation of other microorganisms and the culture medium is very clean. Therefore, Spirulina is a pure food bacteriological level. Especially, it is located at the beginning of a food chain and is therefore less prone to contamination. Its minimum salinity is 10 g / liter but can be up to 200 g / liter. Despite this high salinity, Spirulina is not a seaweed as it contains very little sodium and practically no iodine. It feeds mainly carbon, minerals and trace elements. We find her very special characteristics of living naturally in the Lake Chad, Lake of the oasis of Huacachina, Lake of the Lonar crater.